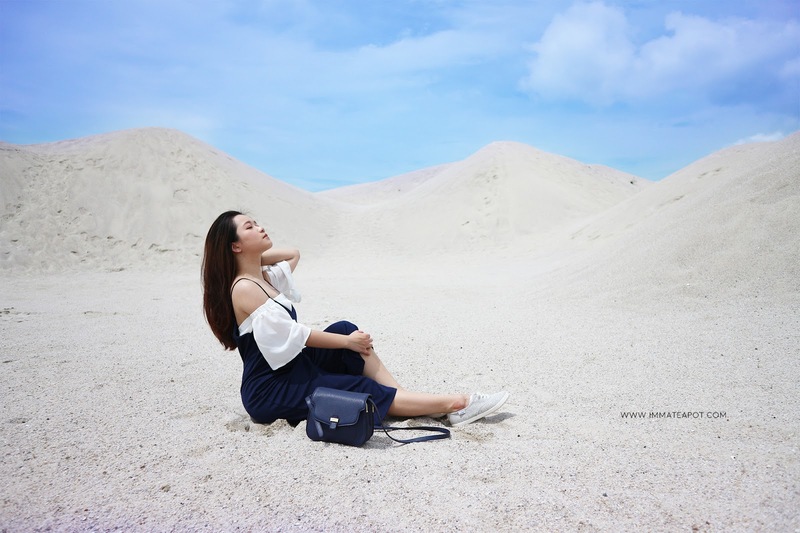 Finally, it's another remarkable trip that marked one of the #BFFgoals with my girl friend, Chency after our last trip to the Capsules few months back! 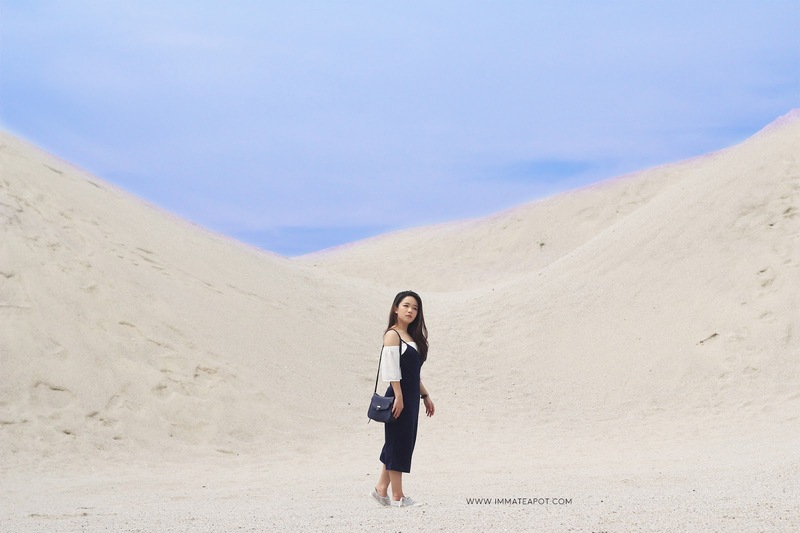 This time, we went to the reknown desert in Melacca! 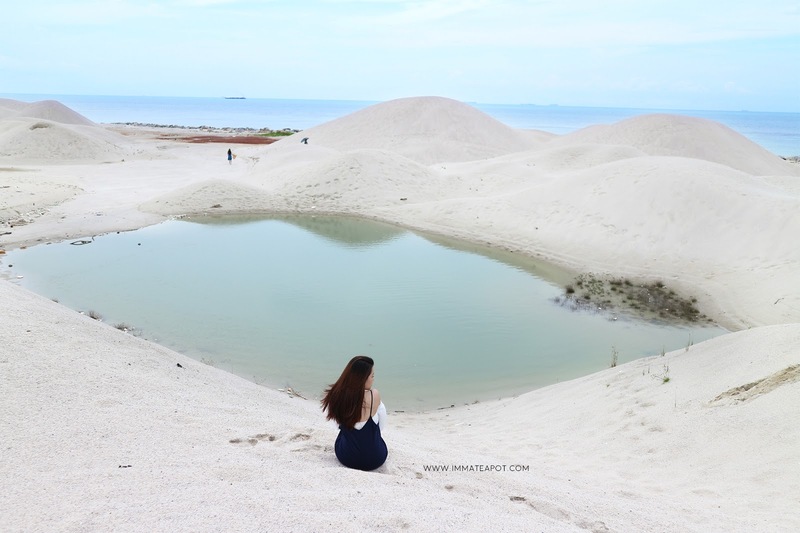 It was claimed as the first desert in Malaysia and named after Pantai Klebang, as Padang Pasir Klebang. I have to tell that, it's a whole new experience and something really different when you get to travel with your best friend, where both of you sharing the mutual interest and passion. Yeah, not every friendship begins in such easy way, they may not last either. Chency and I started our enemy-ship back in secondary school, hell yeah! We even shouted at each other publicly on social media platform. Now, we are friends for years, we blog together, film video together and we travel together! So, back to the trip, it was something real quick and short, because I just wanna share the whole experience with you guys and wanted to get my memories recorded down in here! Why not? It's something memorable and you are travelling with your best friend! Just to make things clear, we both gave priority to photo shooting while travel LOL. It was about 11.30am and we have to walked around 15 minutes to the deserted area after parking our car at the road side. It was so darn hot. OMG. Imagine that this wasn't the real desert yet. Please be sure to put on tons of the sun screen on every single part on your body. How amazing that, there was a sort of lake in the 'desert'? Like a mirage LOL But it definitely adds a little color to the overall pale area, with some bright blue spot at the center, beside the blue sky and occean. Here are some quick Q&A session that I bet everyone of you will be asking. 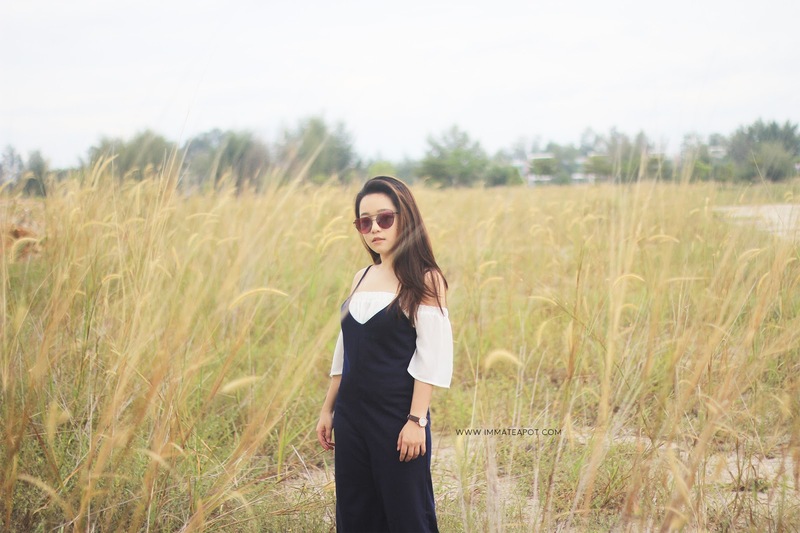 Actually it isn't hard to look for the 'desert' at Pantai Klebang, where you just have to waze [Pantai Klebang Melacca] and it will lead you right down to Klebang beach. The desert is just right beside the beach. With no choice, but you have to park your car near the grassy lane or beside the road, as you are not permitted to drive in. Around 10-15 minutes to reach the desert hill. Early in the morning, around 8am to 10am. Suggested to visit in cloudy day else you gonna injured from sun burn. Evening, around 4.30pm to 6pm. There isn't any road lighting in the deserted area and it will completely dark when the sun sets. Whatever you like but please be reminded to gear in your comfy sport shoes, as you gonna walk a mile on the road that filled with stones and then dunes. Anyhow, your shoes will be filled with sand. 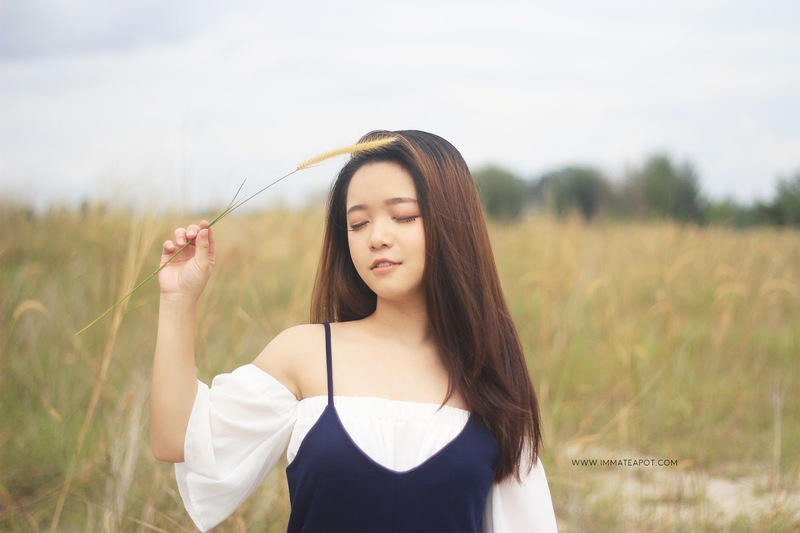 Beside the deserted area, there's a so called photogenic place that work best for photo shoot, a view with overgrown thatch and grass that looks exactly like the Korean-ish pictures on Instagram. It took us about 3 hours to get the photo shoot session done LOL. Then we headed down to the town for some food and of course we would never miss that street shoot again haha! Can I bear with the hot weather? As well as getting tan skin? Btw, both of us were in our favorite bags, shades and watches from Bonia. You may shop all of them at www.bonia.com by coding my name [AMELIEYAP] to get 10% off! Do feel free to drop me some comment or any questions, I'll be glad to answer you! All the pictures looks cool! What beautiful scenery this is. Have heard of Klebang in Melaka but never been yet. Someone I know actually lives in the area. Such a lovely place i dream to visit one day. Never knew that Melaka had so much to offer. Never knew this before! Definitely should be included when i visit Melacca! Waa~ Your photos so pretty! Last time I saw got people share, but until now also haven't visit yet. I love the white sand. I'm sure my children will love this place too. Its been a while since I go Malacca!! This place looks amazing and deserted, perfect place for shoot! Pantai Klebang is near to my house, but I've only been there once. Nice picture, Amelie. 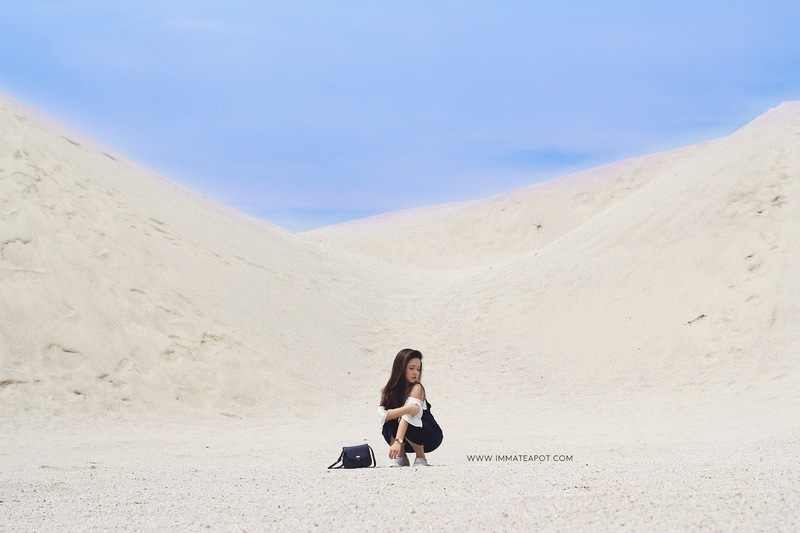 There's also few attraction near pantai klebang that worth visiting too. You should check'em out. This is really a helpful information and the pictures are so lovely. I'm gonna go there with my bff too next month. Thank you!